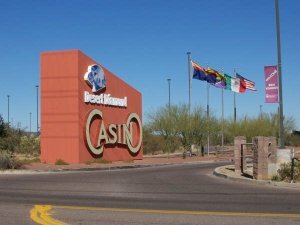 Desert Diamond Casino on highway 19 just south of Tucson, Arizona, allows up to seven nights (free) parking using basic, commonsense rules about what to, and not to do behavior. This is a five star casino with a beautiful convention center that also offers top rated entertainers, boxing and four outstanding restaurants all with reasonable prices. The slots seem to payout on a regular basis as well. While we were there we counted as many as 15 RVs parked there overnight.